This mood board was created to help me figure out my living room remodel. So far I know of 5 things that are certain. 1) We chose Dolphin Fin by Behr for the wall color. 2) The flooring is from Lumber Liquidators called Blonde Maple. 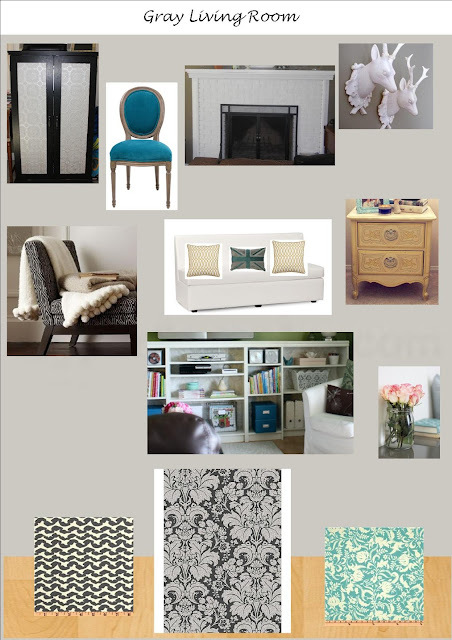 3) The Damask rug is from Overstock. 4) My Mom is making two beanbag chairs with the fabric seen bottom left and bottom right. 5) Fireplace and computer armoire are staying as pictured. Everything else is up for consideration! Joe and I are hoping to DIY a built-in TV wall unit after the floors are done. In the meantime I hope to continue to find inspiration from all the wonderful blogs out there and home decor books.